SEOUL, Nov. 19 (Yonhap) -- Hundreds of thousands of citizens took to the streets in central Seoul on Saturday to call for President Park Geun-hye's resignation in the latest rally underscoring public anger over the corruption and influence-peddling scandal involving her confidante. Organizers said the rally, the fourth of its kind, drew some 600,000 people as of 8:30 p.m. Police put the number at 170,000. A week ago, the weekend rally in the capital brought together more than 1 million citizens, the largest in nearly three decades, according to organizers. People of all ages, including high-school students, some of whom just finished their college entrance exams earlier this week, gathered to chant slogans demanding Park immediately bow out. The latest rally came a day before the prosecution is set to indict Park's friend Choi Soon-sil on a set of charges, which investigators indicated will allude to Park. Choi, who has never had any government post or security clearance, is suspected of having abused her decades-long ties to the president to meddle in state affairs and even influence certain government appointments. Saturday's rally was organized by some 1,500 progressive civic groups, who have not been favorably inclined towards the conservative Park. 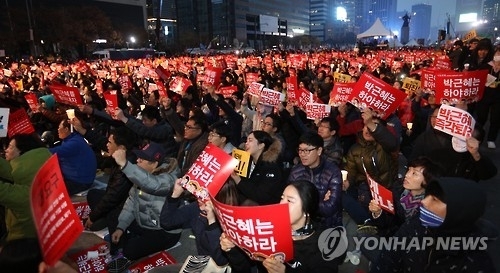 Aside from this rally in Seoul, large groups of people staged separate anti-government protests in some 70 cities, including Busan, Gwangju, Ulsan as well as Daegu, the president's political stronghold. 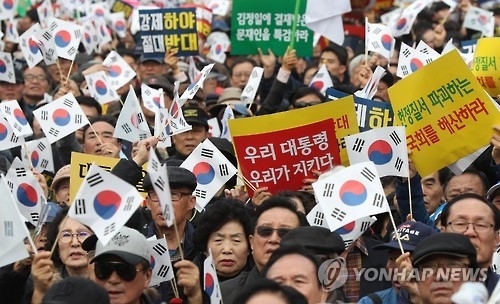 The Seoul rally proceeded peacefully in and around Gwanghwamun Square, just several hundred meters away from the presidential office Cheong Wa Dae. Protesters initially planned to march as close to Cheong Wa Dae as possible. But the plan was thwarted by the court and police, which cited security and traffic concerns. "The president seems to be turning a deaf ear to people's emphatic calls for her to resign, although she indicated she would listen attentively to citizens' voices," said Hwang Su-song, a housewife in Seoul, who attended the weekend rally for the second time. "She appears to believe the protests would, in the end, fizzle out. That is why I came here ... to add to the chorus of the voices calling for her to leave office," she added. Chung Hee-soon, an office worker in Incheon, came to join the rally, along with her teenage daughter. "I think adults should not just sit idle as if nothing has happened," she said. "When Park, instead of refraining from carrying out state affairs, presses ahead with her official duties, this can only be seen as her disregarding the voices of the people." 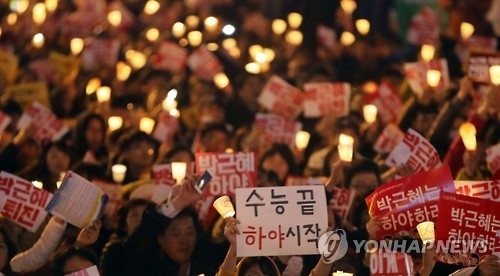 Separately, thousands of Park's supporters staged their own protests in central Seoul, calling on the president not to succumb to mounting pressure on her to step aside. Their rally raised concerns about a possible confrontation with anti-Park protesters, but no clashes were reported. "Parksamo," a local fan club of the president that had staunchly supported the president, had called on its members to show up in force. Members argued that the political motivations by progressives and the opposition bloc were fueling the protests, and that those calling for Park's ouster were making wild, unfounded accusations. "At the core of all the (anti-Park) rallies calling for Park's resignation -- even when she has yet to undergo any questioning -- are the leftist forces," said Lee Sang-hun, the leader of one of some 80 conservative civic groups that joined the pro-government rally. "We should not let these forces take control of our nation." Others argued that Park must fulfill her duties till the end of her term in office as outlined in the Constitution. The president's five year term ends in late February 2018. The weekend rallies put the presidential office on edge. Earlier in the day, Cheong Wa Dae held a meeting of senior presidential secretaries to discuss ways to cope with the protest. "We are seriously aware of citizens' voices while watching this rally," a presidential official told Yonhap News Agency, declining to be named. 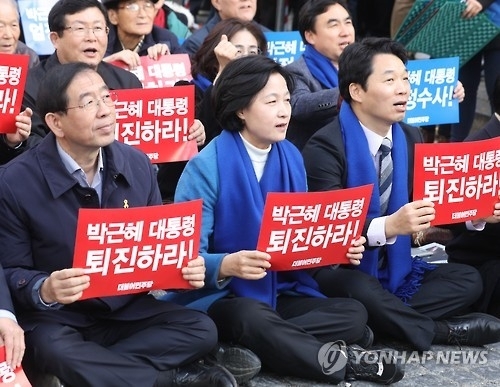 Opposition parties also joined the rally in Seoul, ratcheting up their pressure on the president to accept a prosecutorial probe immediately, retreat from state affairs and resign in an "orderly" manner. "The president has dug in her heels, refusing to accept the prosecutorial probe," Rep. Choo Mi-ae, the leader of the main opposition Democratic Party, said during her party's rally. Rep. Park Jie-won, the interim lead of the minor opposition People's Party, called on his party members and citizens to strengthen their coalition to oust the president. "The People's Party will be united along with you, citizens, to push the president to definitely step down," he shouted. Presidential hopefuls from the opposition bloc also joined the anti-Park rallies across the country. Moon Jae-in, former leader of the Democratic Party, mounted a verbal attack on the conservative political forces, claiming that they used state power as a means to pursue personal interests. "We must deliver our judgment on the conservative forces that bungled our economy and security and divided the nation," Moon said as he attended a rally in his hometown of Busan. Ahn Cheol-soo, former co-chair of the People's Party, pointed to the large number of young students as evidence that people's fury over the Park administration has permeated the entire nation. "Today, many students joined the rally, and President Park should clearly recognize what this means to her," Ahn said during a rally in downtown Seoul. The presidential office and Park's lawyer, meanwhile, said that accusations that the president was dodging a probe are untrue and that she will answer questions early next week. Her attorney, Yoo Yeong-ha, who was appointed on Monday, said he needed more time to prepare and check all the pertinent information on behalf of his client.